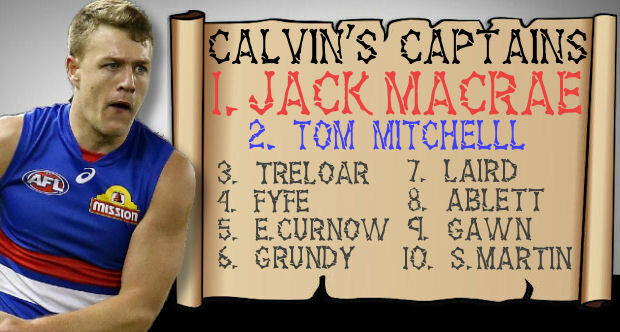 Macrae nearly outscored Mitchell by 100 last week, so how will Cal order the big guns this week? After sitting as my #1 option last week for the first time, Jack Marcae didn’t disappoint. He has now scored 155 and 150 in his last two games and looks set to do it again. Now, playing Adelaide in Adelaide isn’t an easy task. Or is it? Rockliff (127) along with six of his team mates all toned-up last week on the Crows and before that Curnow (137) and Thomas (123) got it done for the Blues and prior to that Lyons (131) and Swallow (130) scored with ease as well. Macrae scored 103 on Adelaide last year (at AO) but is he due for a tag? Surely he is, but no one ever does it. Hugh Greenwood would be the man I would send to the ball magnet, but I strongly doubt this will ever happen. His name is in lights at the moment though after his 47 touches last week and if you have the man averaging 150 in his last three, you might as well roll with him again. 92% of the Fantasy world don’t own him, but Ed Curnow keeps proving himself as a legit Fantasy stud with scores of 142 and 137 in his last two games. Averaging 120 for the year, this jet ranks as the #2 man in the game at the moment. Curnow is up against the Demons this week, a team he scored 86 on last year, but as you know in 2018 he is different man, scoring over 130 four times which also includes a he 160. WHY NOT TAG HIM AGAIN? After Hewett and the Swans tagged Tom Mitchell to just 58 last weekend, why wouldn’t the Lions tag him again. He has proven to be susceptible to a tag and maybe, just maybe the Lions are looking at a plan to tag this week, potentially for the first time this year. Mitch Robinson is the first option. He hasn’t tagged this year, as they are using him as one of their main play-markers and ball winners. He has been sensation this year and I doubt they will take him away from the role he has been doing… and doing well. Nick Robertson is the other option they have. He tagged Isaac Smith last year when these teams met and held him 62. So… last year, Tom Mitchell scored 132 on the Lions but his 58 last week (lowest score since wearing a green vest in 2014) has certainly dented any confidence we used to have in the pig. Last week against the Lions, the Bulldogs went to town scoring points at will. Jack Macrae of course had his 155 from 47 touches and Hunter (105) also found the pill 33 times. Bont (117) also toned-up with 4 goals and Suckling (102) also cracked the 30 possession mark as McLean (109) found it 26 times. The week before that, 7 Collingwood players scored triple figures. The point here is this… the Lions give up plenty and if the pig can cash in on what Macrae did… maybe, just maybe he’ll triple what he scored last week. Ben Jacobs ran with Dusty Martin last week as his Fantasy scores continue to plummet. He has now averaged 81 in his last three games and has dropped a massive $162K in value. This week though, he should bounce back against the Eagles. In his last three games against them he has scored 156, 68 and 150. Now, making him your captain comes with a huge risk of course and not a recommendation I will give, but all I’m saying is… maybe this is a turning point for the Brownlow medalist. Last year in China the scores we’re much bigger than usual. If anyone saw the game last year, it was disgusting great. Players were on holiday mode, bruise free footy. Boak (153) led all scorers ahead of Hall (134), Polec (127) and Kolodjashnij (126). In fact they were career-high scores for Boak and Kolo with 11 players scored 100 for that day. Enter the pig… Tom Rockliff fresh off the back of a nice 127 last week. He attended a season-high 19 centre bounces. Rocky had 127 and 123 on the Suns last year and will be ready to enter our teams after his bye. Robbie Gray could be huge here but hasn’t been against the Suns recently with scores of 66 and 61. He had 104 last week and comes with a huge risk based on his history and most recent China game. Gary Ablett v Essendon @ the MCG: A 66 points second half got Gaz to 105 last week, but he only played the Bombers back in 2016 and just 3 times over the last 6 years with scores of 134, 136 and 160. Bryce Gibbs v Bulldogs @ Adelaide Oval: Scored 113 last week and 74 and 100 as a Blues on the Dogs last year. Stephen Coniglio v Kangaroos @ Blundstone Arena: Ben Jacobs will tag…. Shiel maybe, which will be good for Cogs even though he only had 72 on the Roos last year. Mitch Duncan v Essendon @ the MCG: Averaging 107 in his last 3 games, he scored 91 last year on the Bombers. Rory Laird v Bulldogs @ Adelaide Oval: Just 82 last week but this should be much easier for the defender who scored 135 on this lot last year. Taylor Adams v St Kilda @ Etihad Stadium: Is he finally back? Had 124 last week, but was one of 6 Pies to score 120, so it wasn’t overly hard. Had 107 and 106 on the Saints in his last two. Patrick Dangerfield v Essendon @ the MCG: Attended just 6 centre bounces last week and is now destined for FWD status. 106 and 109 are his last scores and he had just 88 on Essendon last year. Matt Crouch v Bulldogs @ Adelaide Oval: 110 last year on the Dogs, but only averaging 98 since retuning from his hammy. Zach Merrett v Geelong @ the MCG: Muppet scores of 81 and 64 in the last two weeks and if Scooter Selwood plays this week, expect something even lower. With that said, Cats have been giving up some points 6 Pies scoring over 120 last week. Nat Fyfe v Sydney @ the SCG: Carries a lowest score of just 99 in his last 7 games against the Swans and has scored 107, 114 and 110 in his last three at the SCG. Hewett may tag, which is the only slight concern. Steele Sidebottom v St Kilda @ Etihad Stadium: 113 last year, just too hot and cold at the moment. Sam Jacobs v Bulldogs @ Adelaide Oval: Due for a rest I believe and only scored 77 and 82 against the Dogs in the past. Had 53 last week (32 hit outs) after a knock to his back slowed him right down. Lachie Neale v Sydney @ the SCG: Or will Hewett tag Neale? He had just 32 on the Swans last year, no injury and no tag. Did have 131 before that though in 2016. Brodie Grundy v St Kilda @ Etihad Stadium: Against Hickey this week, who has given Sandi (96), Gawn (111) and McEvoy (107) a few points in recent weeks. Had 118 on them last year. Josh Kennedy v Fremantle @ the SCG: Just when we think he’s back, he has 62. Could even be tagged by Banfield this week who claimed another scalp (Steven 90) last week. Adam Treloar v St Kilda @ Etihad Stadium: Fremantle found so much ball last week against the Saints that saw Fyfe (36d), Blakely (35d), Langdon (33d) and Neale (32d) all clock up solid numbers. I like Treloar this week based on this and I’m happy to overlook his history against them where he has scored 93 and 85 in his last two. Max Gawn v Carlton @ the MCG: Up against Kreuzer this week who returned with a nice 129 in a game where Bellchambers even had 95 back on him. Max has averaged 119 in his last three this year but only had 76 and 95 on the Blues last year. Dayne Zorko v Hawthorn @ the GABBA: 115 backed up his 176 from two weeks ago and he even had 125 on the Hawks last year. Back playing well again and returns home for another 120+ you’d think. But who knows with him. High risk, high reward. Stef Martin v Hawthorn @ the GABBA: Had 134 on the Hawks last year and has been in form scoring 113 and 130 in his last two runs. have both Macrae and Titch but am going with Titch, Brisbane arent going to tag and I think Adelaide will do a team tag on Macrae like they did on Cripps and he scored only 82 as a result. Why won’t they tag? every time he’s tagged Hawthorn lose. Hawks need O’Meara, Shiels or anyone else stepping up. ATM Hawks midfield is poo and Titch is hurting because of it. What about Sicily, could be huge against the lions? Could be for sure.. I can see Titch fuming by his performance last week and want to make a point this week though. That said, Sicily vs Lions could be nasty and is the main reason I’m grabbing him over McLean or Yeo (need a Rd 12 bye keeper for team balance). If Macrae goes another 130+, can he get throned as our new pig? He needs to crack a 170+ score. with some consistency too, not just 7 bloody rounds. Needs 2-3 seasons of 120+ average before consideration, in my humble opinion. Curnow’s probably going to get done for a week. Does everyone shuffle up one? 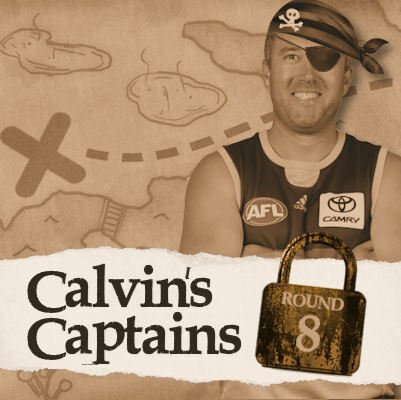 Haha, the AFL is challenging the Curnow verdicts! Ypu might have to do a Mk II, C8! As a non E owner, I’m pretty chuffed. That could be 60+ point advantage on the competition for a couple of weeks. If Hawkins got 1 week for the little hand push, Curnow with a chest push is in trouble! Im not too worried about Jacobs missing. Big O is my R3 and he has outscored Sauce more than once. Hi all, and I totally agree with Roy about Rocky is at his lowest price ever and he did smash it last week and will again this week, so I am thinking of Trading out Billings and bringing in Rocky and putting the C on him. I know he has a bye the week after but can bring in either Kelly or (st) Phillips for him then that’s the bye’s out of the way for the next few weeks as I done the same with Ryder last year and that worked out ok.
Keep in mind though that Rocky has the bye next week. Personally, I’m going to hold off and grab him the week after Port’s bye if he tons up again this week. Assuming he scores well against the suns, he’s projected to increase about $15k. That’s not nothing, but it’s not much and I’d argue the $15k is worth missing out on if you can have another premium in scoring for you next round, and if you can get Rocky in right after the bye. But that’s just my opinion.